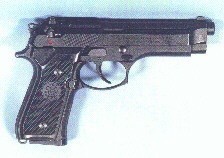 The M9 Beretta pistol is the standard Army sidearm. It replaced the M1911A1 pistol in .45 caliber. It is basically a Beretta 92F pistol and fires the 9mm NATO round. A semiautomatic, double-action pistol, the M9 is more lethal, lighter, and safer than its predecessors. The M9 is carried by crew-served weapon crewmen and by others who have a personal defense requirement, such as law enforcement personnel and aviators. It replaces the M1911A1 .45 caliber pistol and the .38 caliber revolver. The M9 is a light weight, semiautomatic pistol manufactured by Beretta with has redundant automatic safety features to help prevent unintentional discharges. It can be fired in either double or single action mode and can be unloaded without activating the trigger while the safety is in the "on" position. The M9 pistol has a 15-round magazine, and may be fired without a magazine inserted. This weapon can have the hammer lowered from the cocked, "ready to fire," position to the uncocked position without activating the trigger by placing the thumb safety on the "on" position. The 9mm Pistol Program was a Congressionally-directed Non-Developmental Initiative to standardize DoD with NATO and field one handgun for all United States armed services. Beretta of Italy was awarded a multi-year contract for delivery of over 500,000 pistols. The contract award stipulated that production of the weapon must transition from Italian to US production after two years. The US Army is the lead service in this program.